MIDDLETOWN, Ind.-- If you’re experiencing an increase in the number of unwanted calls supposedly coming from a local phone number, you’re not alone. Call 6 Investigates uncovered a growing and disturbing trend impacting Indiana consumers called “neighbor spoofing,” in which scammers spoof phone numbers belonging to your neighbor, doctor’s office, pharmacy and dry cleaner in an effort to get you to pick up the phone. Eileen Riggs of Middleton contacted Call 6 Investigates after receiving phone calls accusing her of being a phone scammer. Riggs was confused because her phone was across the room when she had supposedly been making all of these unwanted phone calls. “Apparently they’re hijacking our phone numbers and they’re using them to call other people so other people don’t recognize it,” said Riggs. Riggs went to the Verizon store in Anderson, but she said a worker just told her not to answer the phone for unknown numbers. Call 6 Investigates did some checking and found Eileen Riggs is a victim of neighbor spoofing, and when ticked off people hit redial, they’re not reaching the scammer--- they’re reaching victims like Riggs. Consumers Union, the advocacy division for Consumer Reports, is calling on the Federal Communications Commission to require phone companies to implement caller ID authentication technology. Mahoney said neighbor spoofing is a “disturbing” trend because it makes it nearly impossible for law enforcement to track down the real caller. "It makes it harder to block these calls because callers are continually cycling through different numbers so it's difficult to be able to stop them," said Mahoney. Call 6 Investigates contacted Riggs’ provider, Verizon Wireless. Van Dinter says if your number is being spoofed, the best course of action is to report it to the FCC . Verizon also offers a number of options for blocking incoming spam callers through number blocking as well as its caller name ID service , which flags calls that are suspicious. The caller name ID service costs $2.99 per line per month, according to the website. 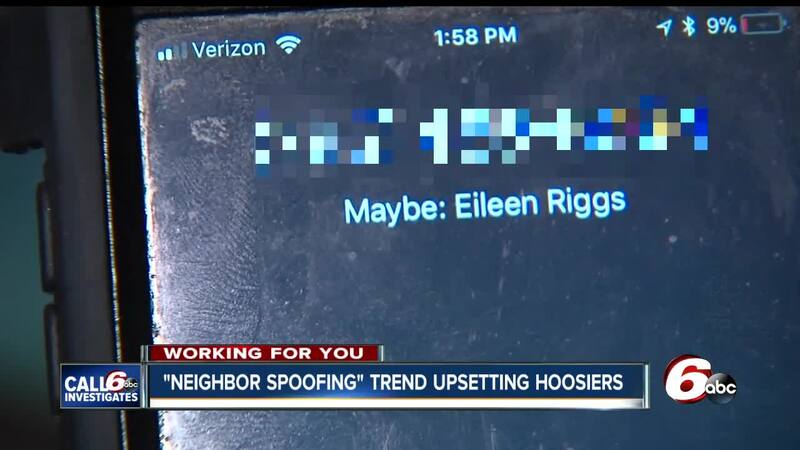 Eileen Riggs wants people to know about neighbor spoofing, and that just because a call looks like it’s coming from a phone number doesn’t mean that’s who really called you. “I’m not going to answer a phone number I don’t recognize,” said Riggs. FCC spokesperson Will Wiquist said encouraged consumers to file complaints about neighbor spoofing. The FCC began seeking public comment on standards to help differentiate legitimate phone calls from those that attempt to trick consumers through caller ID spoofing. On May 10, the FCC announced a $120 million fine against Miami-area telemarketer Adrian Abramovich for spoofing 96 million telemarketing robocalls over three months . Avoid answering calls from phone numbers you don’t recognize, even if they appear to be local. If it’s important, the caller will leave a message. If your own phone number is used in a spoof call, you may receive calls and messages from people asking why you called them in the first place. This can lead to a lot of confusion between the two parties, but knowing your own number can be used by scammers may help explain the situation. Be aware that phone numbers of local businesses, including doctor’s offices and/or insurance agents, may appear to be calling you. If you’re not certain whether the call is legitimate or a spoof, hang up and dial the known phone number for the contact to verify the communication, especially if personal and/or financial information is being requested. There are call blocking apps that may help decrease the amount of spam calls. Your phone carrier may also provide a similar service or offer advice. Make sure your phone number is on the National Do Not Call Registry . Though it is unlikely to prevent most scam calls, it will help to reduce calls received from legitimate telemarketers, which can be helpful in screening fraudulent calls. Apps like NoMoRoBo and Robokiller can help you cut down on unwanted calls. Call 6 Investigates checked with AT&T to see what they’re doing to address neighbor spoofing. A spokesperson referred us to two websites: AT&T Cyber Aware and AT&T Cybersecurity that provide tips for customers. AT&T also offers several services you can download to help identify details on unknown calls and suspected spam. The basic version of AT&T Mobile Security & Call Protect is free and Call Protect PLUS is $3.99 per month . T-Mobile offers several free options for its customers including Scam ID, which allows you to immediately see when calls come in from known scammers . Scam block allows you to block all known scammers before they reach you. And for $4 a month, T-Mobile also offers Name ID which allows you to identify any caller’s name and location, and block any personal number that’s not in your address book . Name ID will also allow you to see the type of organization that may be calling, including telemarketers, political organizations and survey collectors.